LOS ANGELES (JTA) — Part “God Bless America,” part “Shabbat Shalom,” the Fourth of July this year falls on a Friday. In this land of religious freedom, how do we plan to observe both? As the sun sets over the “fruited plain,” will we be lighting Shabbat candles and fireworks? How will the Sabbath Queen look in red, white and blue? Those who traditionally observe the Sabbath by not kindling fire surely will take a pass on the “rockets’ red glare.” But for many U.S. Jews and congregations, the day represents an opportunity to integrate Jewish themes into a national day of celebrating our freedom. As a kid, like many boomers, I remember the Fourth as a day of firecrackers, spark-shooting fountains, backyard barbecues, parades and family picnics. Several synagogues this year will incorporate the same elements into their congregational programming. On that Friday, when singing “Lecha Dodi” and hearing the boom of fireworks, or seeing them explode in the sky, I wonder how the verse “Awake and arise to greet the new light, for in your radiance the world will be bright” will resonate. Could it apply to celebrating the birth of a nation? “Wear red, white and blue and bring your lawn chairs,” the site urges. “No alcohol please,” an accompanying flier says. I suppose that means grape juice for Kiddush. Luski recalls his own roots — grandparents who moved to Cuba from Russia-Poland, and parents who immigrated to America. “I appreciate being accepted in the U.S. as an immigrant,” he says. Perhaps with that journey in mind, Luski offers a unique connection between the Statue of Liberty and a mezuzah. “Just as a mezuzah welcomes you into your home with the values of the Torah, the Statue of Liberty reminds us to treat everyone with friendship, compassion and justice,’ he says. In 2010, near the 50th anniversary of his family’s coming to America, Luski recalls U.S. Rep. Bill Young of Florida inviting him to deliver the opening prayer before the House of Representatives. “What a Jewish journey,” the rabbi exclaims. In Santa Rosa, Calif., Congregation Shomrei Torah is situated on a hilltop half a block away from a professional fireworks show put on at the Sonoma County Fairgrounds, according to Denise Harrison of the temple’s office. Let’s hope the sermon doesn’t run long. In Glencoe, Ill., in addition to parading with the Torah on Saturday morning, members of Aitz Hayim Center for Jewish Living will be parading on the Fourth with a 1953 pickup truck in parades there as well as in nearby Highland Park, which has five synagogues in a city of 30,000. Aitz Hayim Center has been in the parades for 20 years, and Jacobs is proud of the banners they put on the truck. “Values by Lincoln, Body by Ford,” it read one year. Jacobs recalls that one year, seeking to make a Jewish connection to the Fourth, a member dressed up like the Statue of Liberty while holding what looked like a Torah. 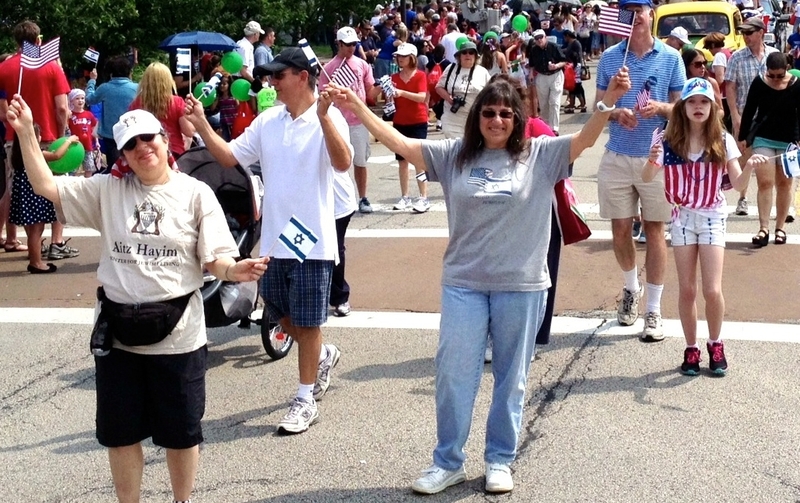 On years the Fourth has fallen on a Saturday, Jacobs says that in an effort not to offend observant Jews, the group walks and doesn’t use the truck.